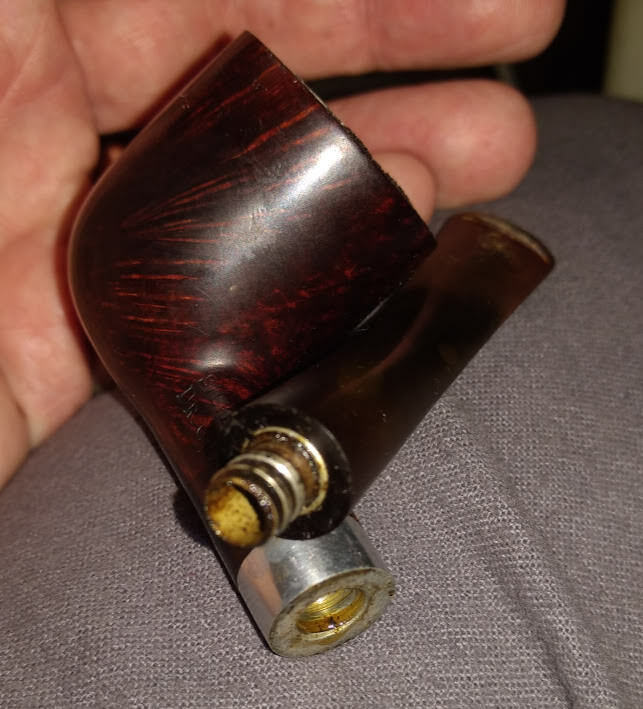 Warning to the OCD - this pipe will not see a pipe cleaner for a few more bowls. By your standards it needed one yesterday. Yes, yes it did . I ended up ordering one of these new Ajustomatics. I will report back whenever it arrives. Try to see it from a different point of view, think of it as seasoning,... like the black coating on the inside of a BBQ pit or the brown film in an often used coffee pot, every bowl that Fr Tom smokes is better than the last one. It really is like the BBQ pit or the coffee pot. They get a cleaner typically when they have some mechanical need for one. So - there is a blockage or some popping from some moisture. I know people say they do it for the taste, and maybe it is a "princess and the pea" thing where my sensibilities are just not refined enough. Not an army bit, but a built in metal screw-in tenon/mortise. It essentially means no more loose stems. Vulcanite tenons and briar mortise have a tendency to smooth out so the stem doesn't stick very well, at which point you have to stretch out the tenon to make it fit again (or use the old tape-around-the-tenon method). The ajustomatic screw-in tenon/mortise is also a fix for the old non-adjustable screw-in tenons, which had a tendency to overturn when hot and then cool in a weird position not conducive to pipe smoking. Essentially, the top of your bowl rim would point east or west rather than north. The Dr G ajustomatic part allowed correction for that overturn without cracking your shank or stem.